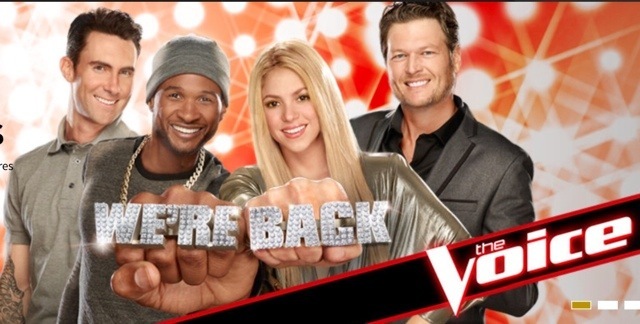 Season 6 of The Voice is set to take the TV stage beginning Monday, February 24th and Tuesday, February 25th at 8:00 PM on NBC. Returning will be host Carson Daly along with judges Adam Levine, Blake Shelton, Shakira and Usher. This lineup of judges works much better, I find. Cee Lo will not be returning for Season 7, which suits me fine. He was struggling over the last couple of seasons and, to my mind, Usher is a better fit. I am assuming Christina Aguilera will be returning to Season 7. Who knows? As always, I expect to hear great singers during the first phase – The Blind Auditions. I do hope the producers scale down the backstories and rehearsal segments – they were tedious beyond words. And, then, after each segment, they would go to a commercial before the singer hit the stage – when all we wanted to do is hear the singer! So, hopefully, they have refined the show and freshened things up. At any rate, I will tuning in tonight and tomorrow. Will you? The comments are now open for business. MCL I think you mean Feb 24 & 25. MCL-I’m excited to watch tonight! I’m hoping The Voice will have a great season. Anita – me too. I love Shakira and Usher so much. They perfectly complement Adam and Blake. Great chemistry. I’m glad to have you reading the TV Guide for me or I would miss all of the season premiers! I will tune in tonight as well and have the same reservations as you. The Voice has been responsive to viewer input and has shown a willingness to change on the fly during the season so maybe they have tweaked the beginning of the season this year as you suggest. I would prefer to have more time shifted to the top ten and have no more than two, preferably one double elimination. I think the fans could become more invested in the contestants if more time was spent at the end. I like the coaching sessions but I don’t like for them to give the whole performance away (and take credit for it) ahead of time. I like this judging panel better as well. I never was a Cee Lo fan but I have been surprised to hear him sing half way decent in other venues. Shakira should be much more comfortable in her role this season. She has a lot of room for growth into the full role of coach/ judge/ mentor but she has the sweet and supportive down pat. I heard that Christina is expecting so I don’t know if she will be back next year. MCL-I agree. The four of them are awesome together! I really like Carson too! i was going to say it, but gene beat me to it…christina is pregnant. so maybe she won’t be back, i hope, i hope. i had saved preston pohl’s audition (electric feel) from last season and would play it back periodically (best song he did), and in it they show christina several times ‘acting’ (pretending to decide should she turn her chair for him). she does a thing of ‘crawling up the chair’ with her hands. she is just so fake it is creepy, and i will be happy to watch shakira again. and i too did not care for cee lo.